Samia Shafique, an undergraduate student from the department of CSE at BUET, had received the ITPEC Examination Gold Award which is given to the International Champion in the ITEE exam. 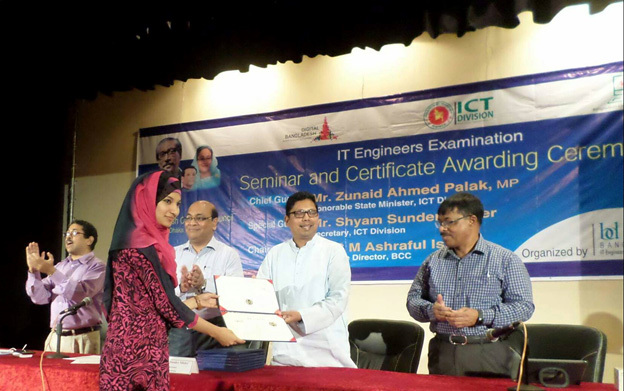 She appeared for the Level-2 Fundamental Information Technology Engineer Examination (FE) exam on May 2015 and was presented the award by Zunaid Ahmed Palak, Honorable State Minister, ICT Division. She is also the only Bangladeshi candidate to receive any of the top 3 awards from ITPEC Exams. ITEE stands for Information Technology Engineers Examination and is the national level IT Engineers Examination governed by IPA, Japan. It is one of the largest scale national qualification examinations in Japan, with approximately 600,000 applicants each year. ITEE qualification is widely accepted in the Asian region and is recognized in China, Chinese Taipei, India, Japan, Korea, Singapore, Philippines, Malaysia, Mongolia, Myanmar, Thailand, Vietnam and Bangladesh. ITPEC is an organization to co-ordinate all the efforts of member countries in the implementation of IT Engineers Skill Standards and IT Engineers Examinations in Asia. Bangladesh joined as ITPEC member country on 1 September 2014. Member countries of ITPEC are Philippines, Malaysia, Mongolia, Myanmar, Thailand, Vietnam and Bangladesh.